I tossed one his way, and we all watched in amazement. As soon as he gulped it down, he was scouring the ground for another. Turns out, peacocks are pretty big fans of french fries. Peacocks stroll around the terrace at Chateau de Lalande. These impressive looking birds have a reputation for being loyal guards, and beautiful ornaments of stately homes. 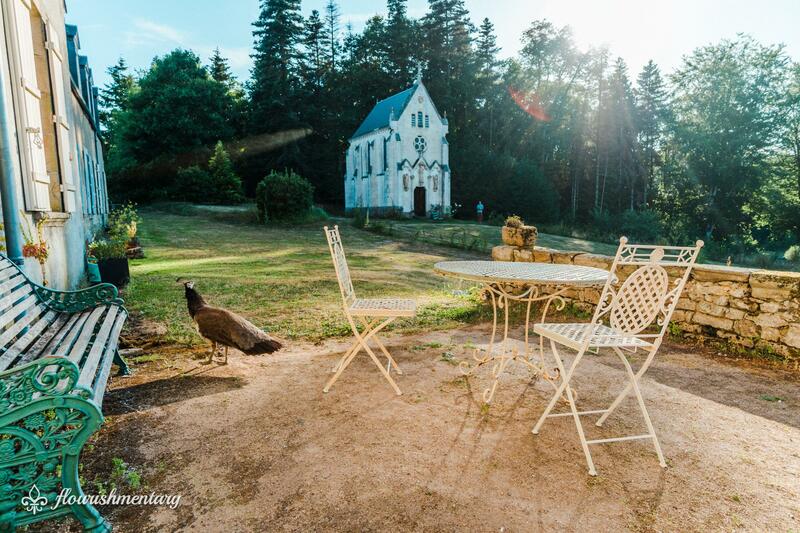 And peacocks are just one of the many staples of castle life you’ll find at Chateau de Lalande. The charming courtyard fountain welcomes you past the iron gates, and the picturesque turrets are a reminder of a fairytale era gone by. I’d always wondered what it was like to live in a castle. To be surrounded by nothing but countryside, and to occasionally get lost on your way to the kitchen. But I’m far from the only one. The demand for castles is booming, and up 55% according to vacation rental site HomeAway. And It’s not just because these sprawling estates have plenty of room for family vacations (though that doesn’t hurt). 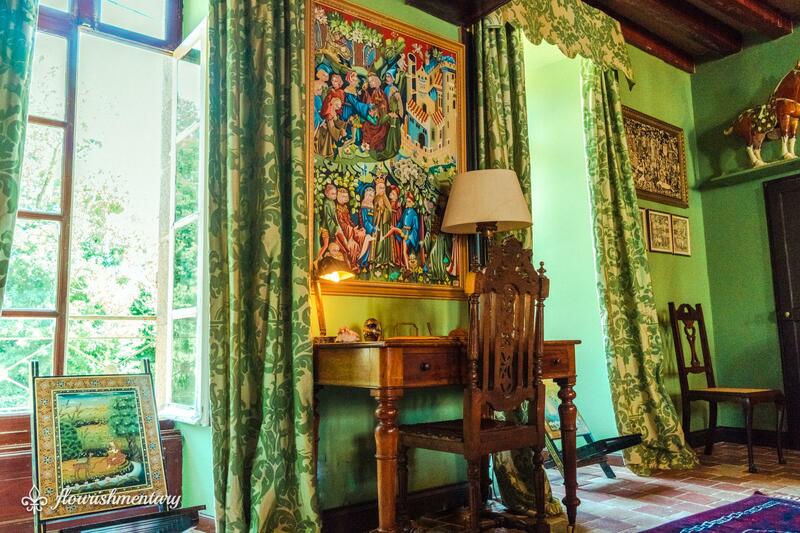 Staying in a chateau offers a window into an enchanting time, when knights roamed the lands, and magical tales weren’t written off as fiction. For the full video tour and interview with Stephanie, scroll to the end of the post. A small bridge over the Chateau’s moat. It was that sense of magic that inspired Stephanie Jarvis to become a Chatelaine. 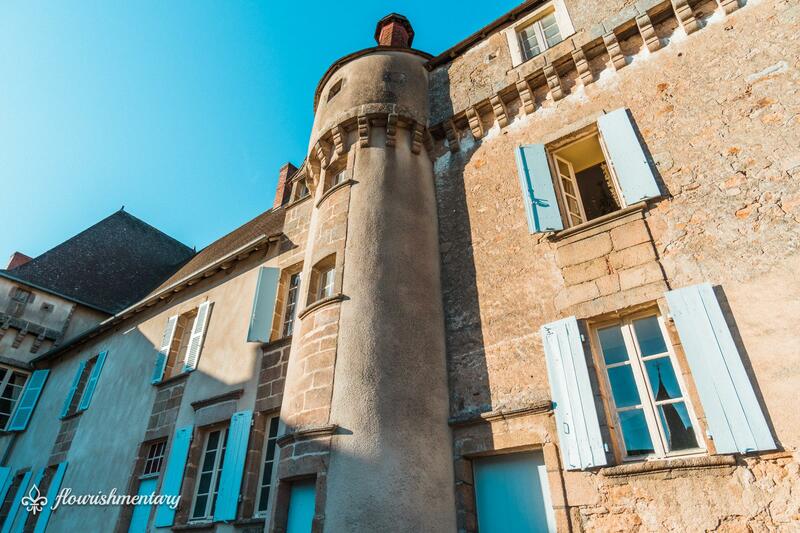 In the early 2000’s, Stephanie fell in love with a 16th century castle in the heart of France. Since then, it’s been her life’s work to restore it to its former glory, ushering in a new age for the historic home. 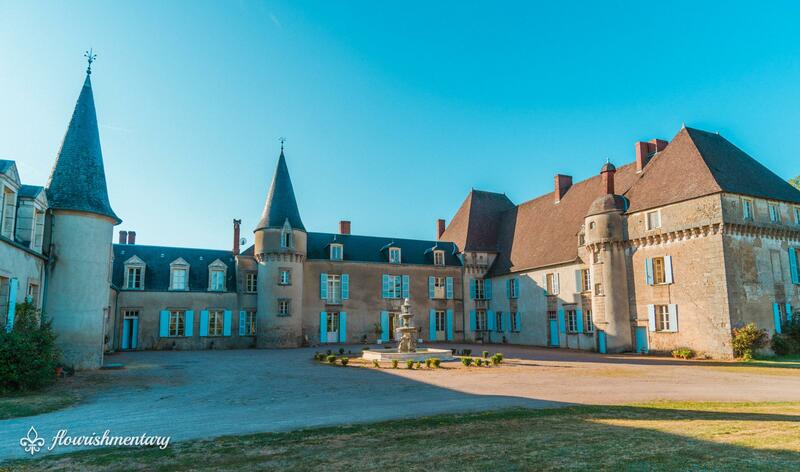 For some, the choice to live in a chateau may seem a little unconventional, but for Stephanie, it made complete sense. As a young child, she often read fairy tales, and would imagine living in a castle. 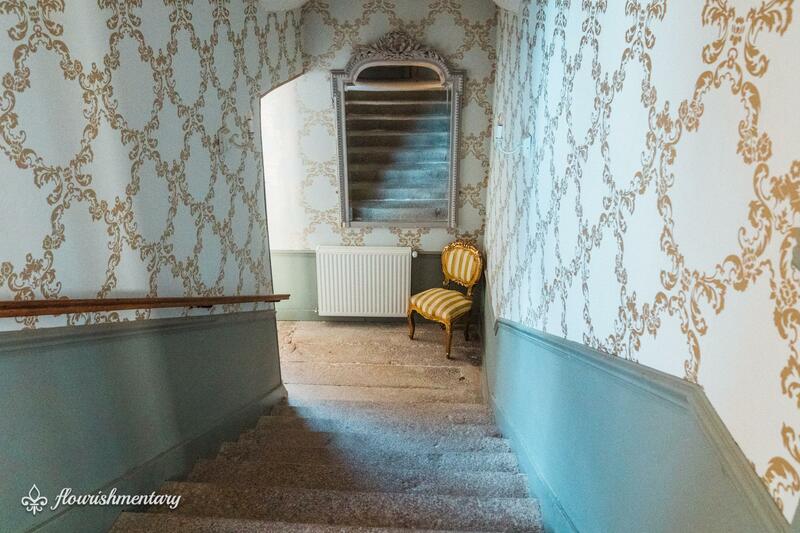 So, when her parents decided to risk it all, by restoring an old mansion in the South of England, she figured things were just going according to plan. 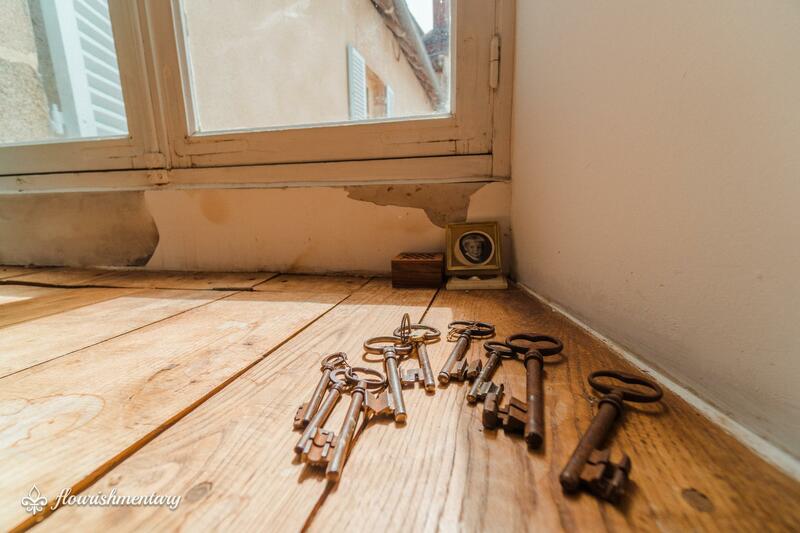 Her parents put in painstaking work to revive the forgotten property, where they looked after patients with Alzheimer’s. Stephanie’s Mother Isabelle, a nurse, believed that beauty soothes those who are unwell, and this setting provided them a peaceful haven away from sterile hospital rooms. 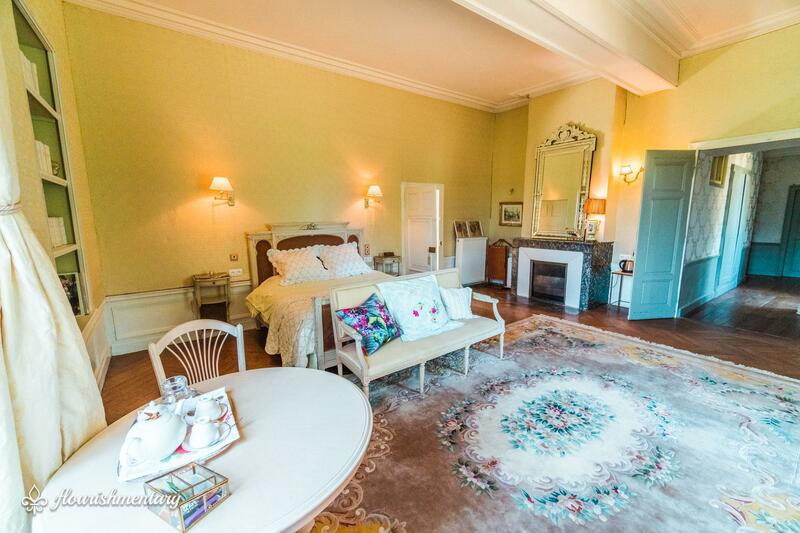 They restored the estate room by room, setting the example for their daughter that with perseverance, reviving a home of this magnitude really is possible. After years of living in London, one of the most expensive real estate markets in the world, Stephanie began to consider grander properties on the other side of the English Channel. Though everyone else thought she’d gone crazy, Stephanie and a close friend decided they’d band together to sell their London flats, and buy a French Chateau. Being half French, she was better equipped than most to embark on a grand chateau hunt for a future home. 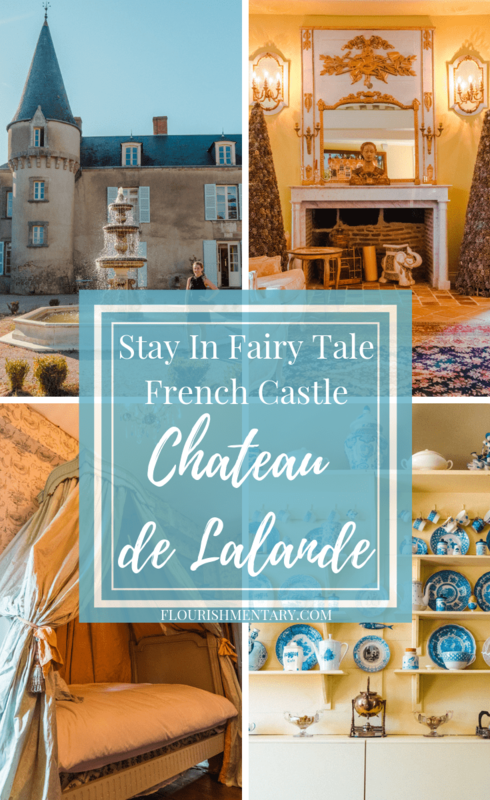 “We must have toured 15 to 20 properties before seeing Lalande.” Knowing the amount of information overload that comes with big decisions, I was curious if Stephanie had trouble with such a monumental one. “I decided we would buy before we came inside.” One look at those turrets myself, and I could see how it was a match made in heaven. But before she could “swipe right” on her dream home, the sellers needed convincing. 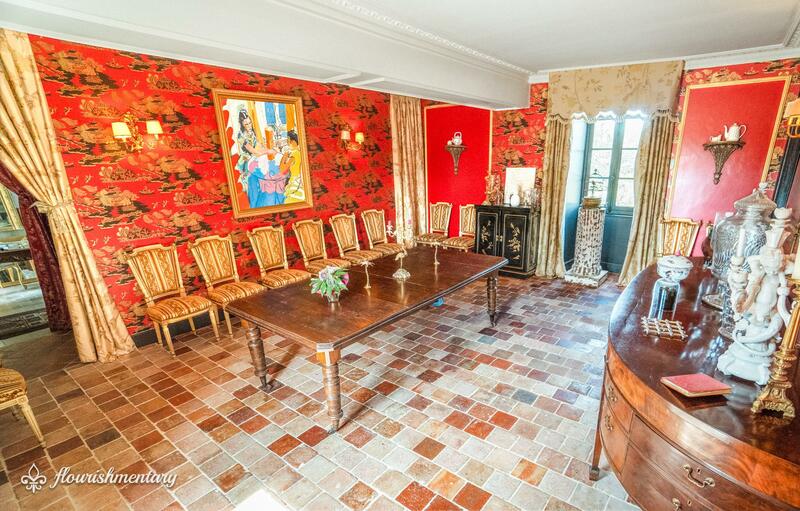 The entry hall welcoming you to Chateau de Lalande. 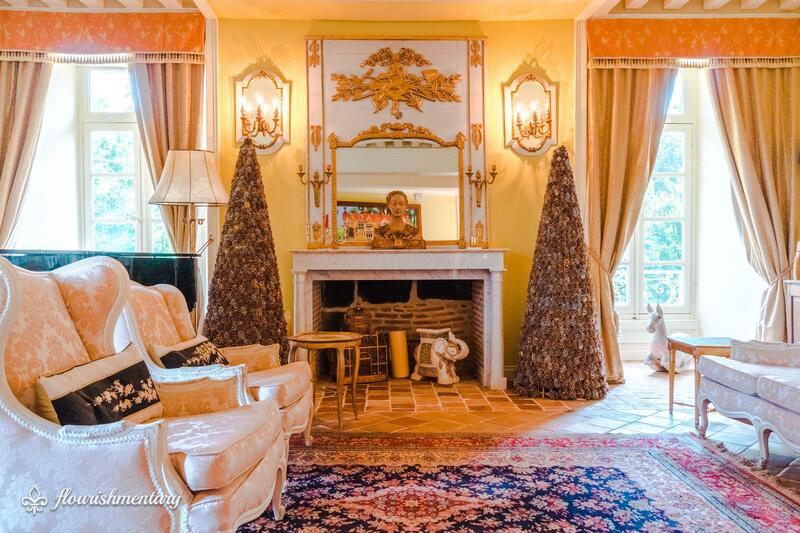 See, the owner was a French Marquis, whose family owned the castle for the last 200 years. He was extremely fond of it, and was afraid a buyer would split it into apartments. That’s why he wanted to hold out for an offer from a family, who’d be more likely to keep it for generations. Stephanie wasn’t his first pick, however her offer was on the table before anyone else’s. The Marquis wanted to do the honorable thing, so he invited Stephanie and her mother to stay, and experience chateau life firsthand. The staircase in the oldest wing of the chateau, with original stone steps. Just as Stephanie suspected, the place felt like home. The Marquis could see her passion for the castle, and his misgivings began to melt away. At the end of her stay, he agreed to take a leap of faith, and make her the next Chatelaine of Lalande. When he returned with his entire family to celebrate his 50th wedding anniversary, he knew he’d made the right choice. The Marquis was able to see the immense progress made to the beloved estate, and knew its history was being honored. 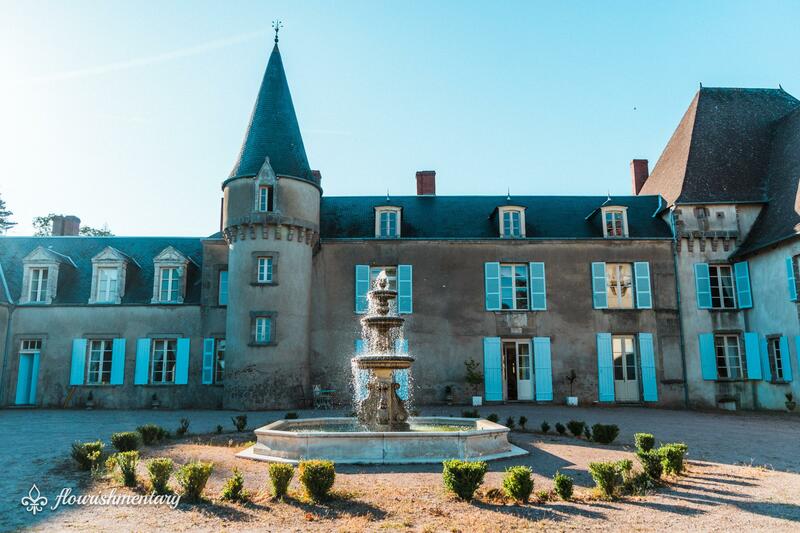 The chateau was named after the Lalande family, who have roots all across France. In fact, it’s one of two grand estates in the country still bearing their name. 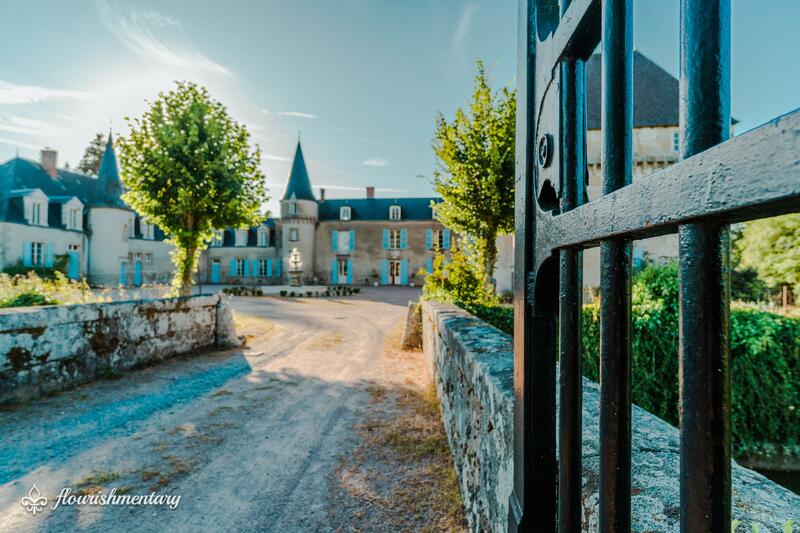 The oldest wing of the chateau dates back to the late 15th century. The east wing is the oldest part of the structure, with its robust, fortress-like appearance. The large square and semicircular towers date all the way back to the late 1400’s, during the Hundred Years’ War. Since France and England had been at each other’s throats—for, you guessed it a century—Lalande had to be prepared defend itself from enemy attacks. Though the border was nearby, the chateau was fortunate enough to avoid any battles at its doorstep. The castle as you see it today was finished in the 16th century. Two additional turrets complete the majestic façade, really adding to its fairytale aesthetic. 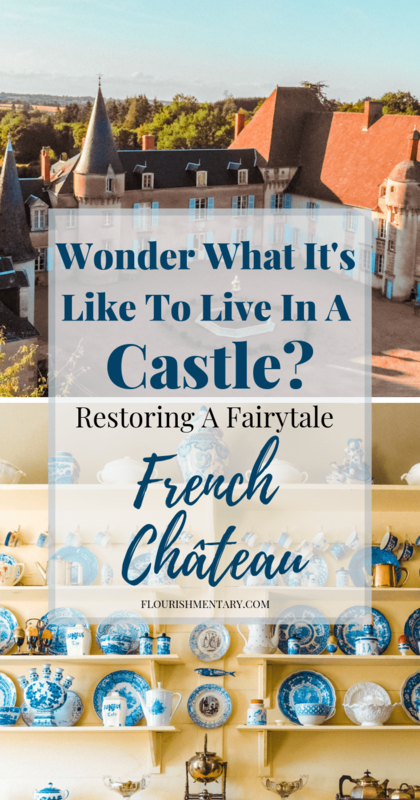 Political shifts meant the chateau would change hands throughout history, so when Stephanie bought the home, she was excited to learn about its former residents. One of the most notable, was a very interesting member of the French Royal Family. The starry hand-painted ceiling of the chateau’s chapel. The chapel doors and stained glass windows are now being restored. Lalande was once owned by the cousin of King Louis XIV, Anne Marie Louise d’Orléans, Duchess of Montpensier. Also referred to as the “The Grand Mademoiselle”, she was the wealthiest single princess of Europe. As a free spirit, she decided marriage was not always in a woman’s best interest, and never accepted the proposals of her suitors. Instead she lived her life as she saw fit, defying many of the expectations that came with her royal position. Having one of the “Granddaughters of France” among those who walked its halls, is a special chapter in the chateau’s history. 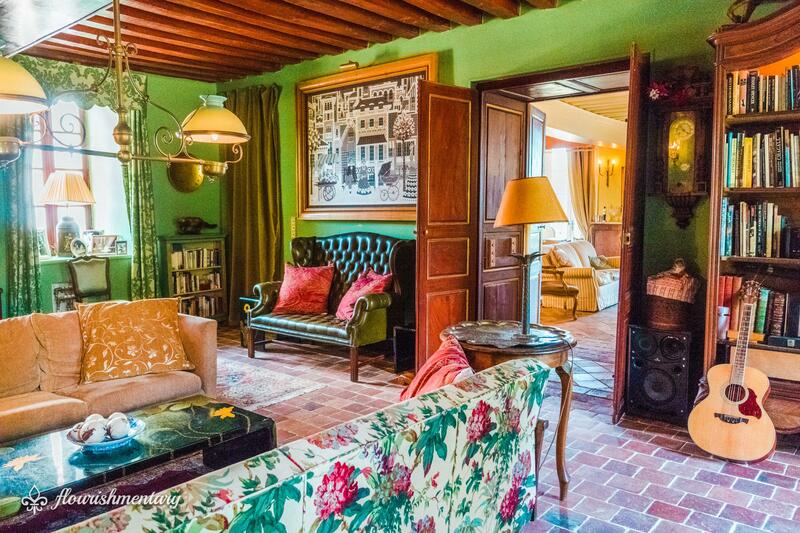 Unlike others on the market today, Chateau de Lalande retains many of its charming historical features. It’s surrounded by a medieval moat, filled with carp who regularly enjoy day-old baguettes. Stephanie later brought in more wildlife to the mix: 6 mini sheep, 3 chickens, and 2 free roaming peacocks. To the west side of the property, she revived the garden that’s supplied the castle’s residents with vegetables for centuries. 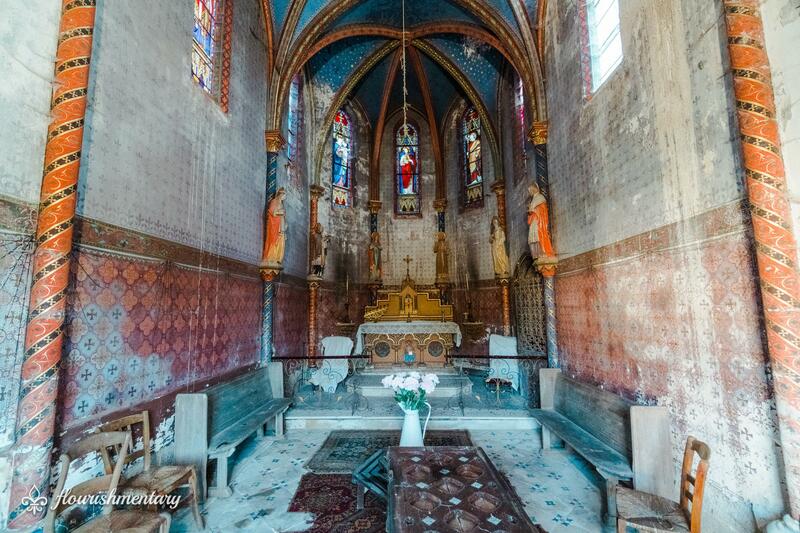 And behind the chateau you’ll find my favorite feature: a petite early 19th century chapel, with a hand-painted starry ceiling. 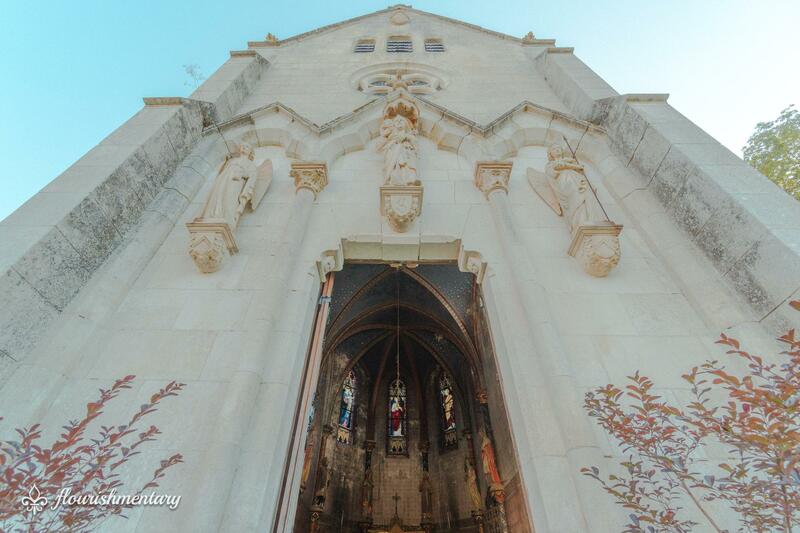 It was the small church that needed the most love when Stephanie moved in. Part of the roof had collapsed, and caused some serious water damage. She knew if they didn’t address it right away, the delicate frescos would be lost. 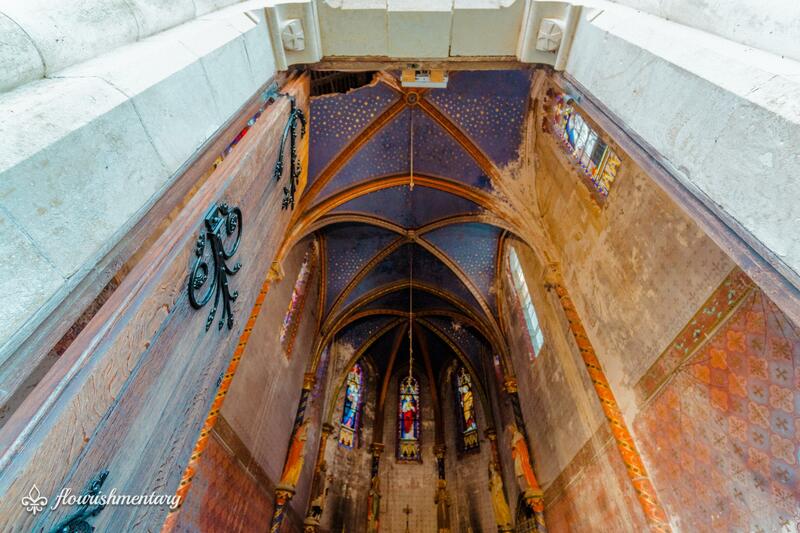 After replacing the roof, they set their sights on the longer-term goal of restoring the ornate stained glass windows, one by one. Instead of jumping right into the renovations of the main house, Stephanie and her family decided to give it a full year. They wanted to really understand how they would use the space first. While patience is a virtue, especially when it comes to big decisions, this made for a tough first winter. Having to cope with below-freezing temperatures inside the castle would be enough to have some packing their bags, but Stephanie was loving every minute of her new adventure. Stephanie described how the kitchen was covered in Formica surfaces, and the main floor had been broken up into a labyrinth of smaller rooms. 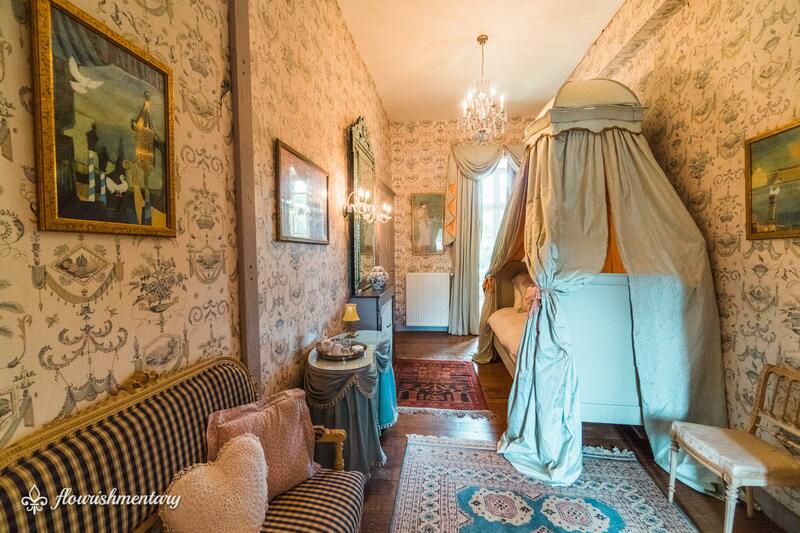 While in theory this would make the chateau seem cozier, it eliminated natural light causing rooms to feel dark (and a British term I now love) “poky”. She couldn’t wait to open up the space, but knocking down the walls meant all the floors on the main level needed to be removed. Luckily, while rummaging through a storage area in the attic, Stephanie uncovered a treasure trove of vintage terracotta tiles. Only one issue: there just weren’t enough of them to cover the entire space. 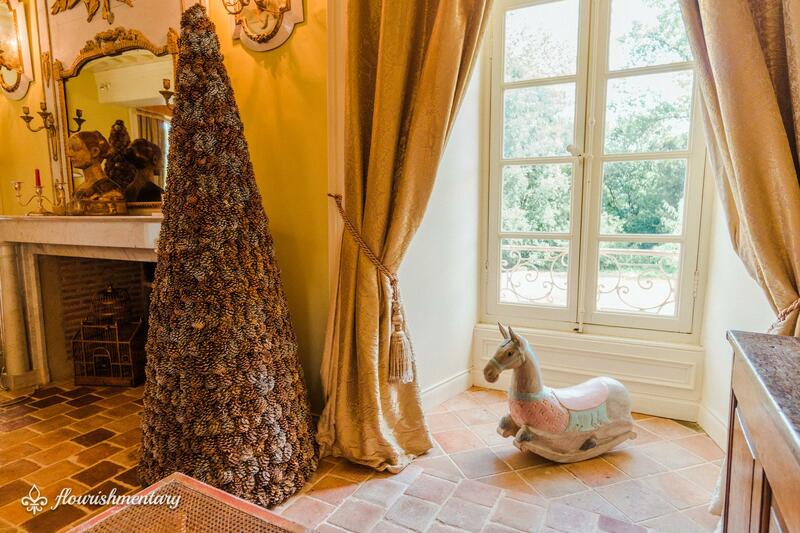 “We had to source the rest from all over France.” Though it took extra time to find coordinating tiles, the vintage patina looks right at home in the chateau. A sitting area of the Grand Salon. 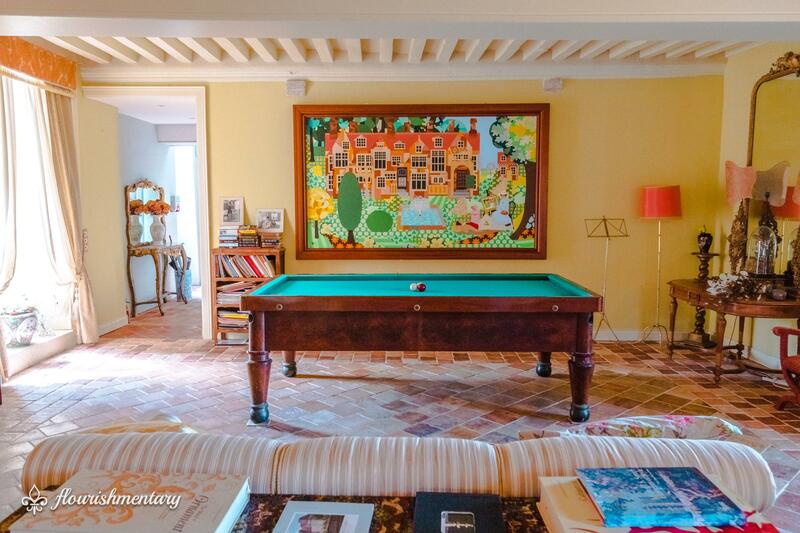 The chateau’s original french billiard table from the early 19th century. The first three years were the most difficult for Stephanie and her family. They lived in the midst of constant repair work to modernize the home with 21st century conveniences. The behemoth tasks included removing walls and asbestos, installing a new sewage system, digging boreholes for geothermal heating, and an overhaul of the plumbing and electrical. By the time it was finished, they hadn’t been able to spend any time decorating! They were ecstatic when they were finally able to put down the power tools, and turn their attention to the finer details. The dining room, with antique terra cotta tiles. Finally the real fun began: decorating an enormous castle with nearly twenty bedrooms. Stephanie remembers buying just about every design book she could get her hands on, and letting inspiration take hold. The layers of vintage decor betray a passion for the World of Interiors aesthetic, which I’m also extremely fond of. You can really tell that Stephanie and her family had a blast sourcing antiques and vintage treasures from markets across Europe. Many of the rooms are also complimented by imaginative paintings, mixing almost pre-Renaissance perspectives with modern color palettes. When I asked about the artist, I came to learn it was Stephanie’s late father. Sadly, he became ill, and passed away only a few years after Stephanie bought the chateau. The paintings are a beautiful nod to his memory, and brighten up every area of the restored castle. The winter salon featuring artwork by Stephanie’s late father. Stephanie was also lucky enough to hang onto a few pieces of the chateau’s original décor. A beautiful French billiard table from the 1800’s cheerfully welcomes you into the Grand Salon. The kitchen was transformed into an airy space, housing the original stove and spacious kitchen table. 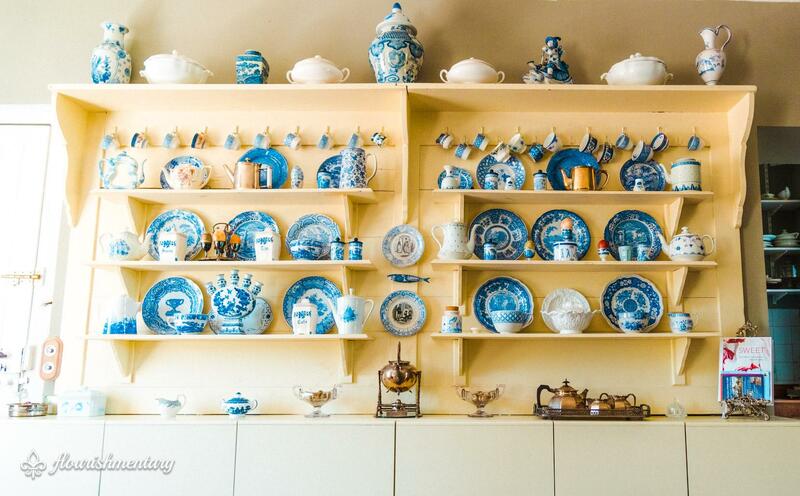 The centerpiece of the room are the charming cabinets, which Stephanie salvaged from a storage area, and adorned with blue and white pottery. It’s now a welcoming sign that you are, in fact, in a French country kitchen. The french country kitchen opens onto the terrace. 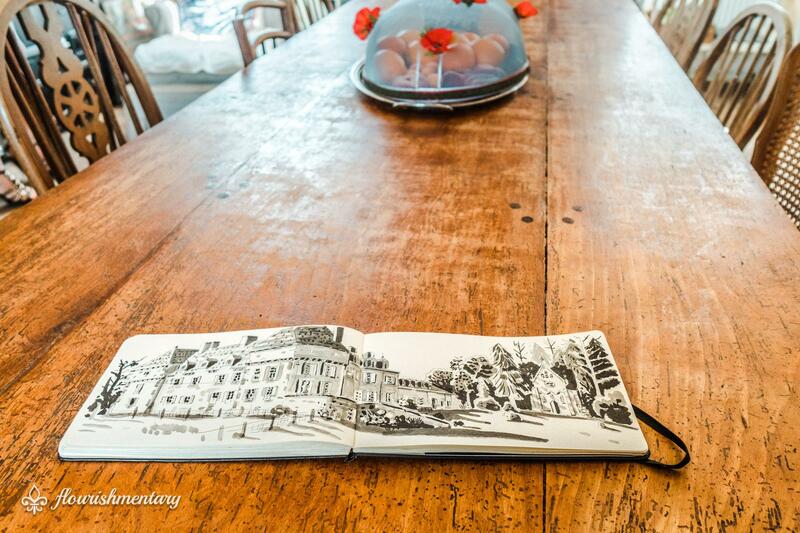 A sketch of Chateau de Lalande by one of the B&B guests. Restored cabinets with English pottery from Stoke-on-Trent. In another nod to the past, Stephanie named some of the guest rooms after the chateau’s previous residents. The Chambre de Roger (Roger’s Room) was named after a dutiful valet of the Marquis. Stephanie restored the original canopy bed, and jokes that though she kept his name, it’s now the most feminine room in the house. The Chambre de Bonne Maman, (a polite french term for grandmother) was a nod to the previous Lady of the House, the Marquise. 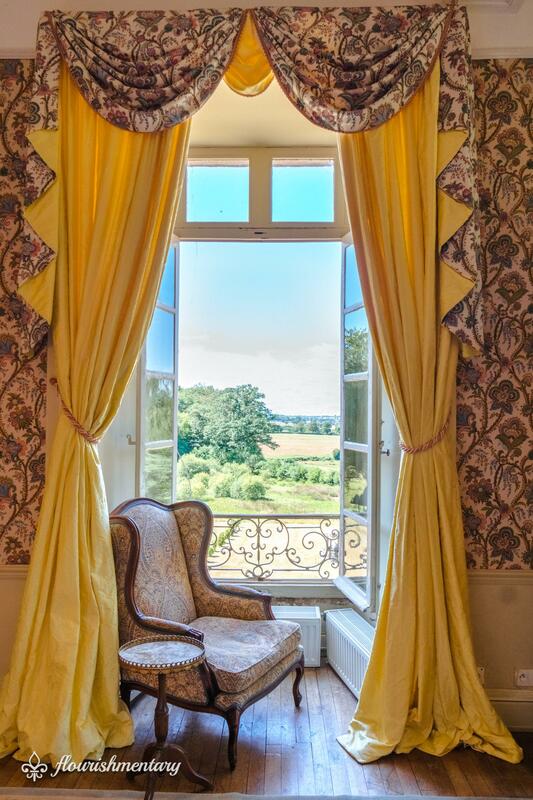 Pieces of her original Belle Époque furniture balance out the sweeping views of the French countryside from every window. Stephanie has a real adoration for textiles, and is also quite the talented seamstress. 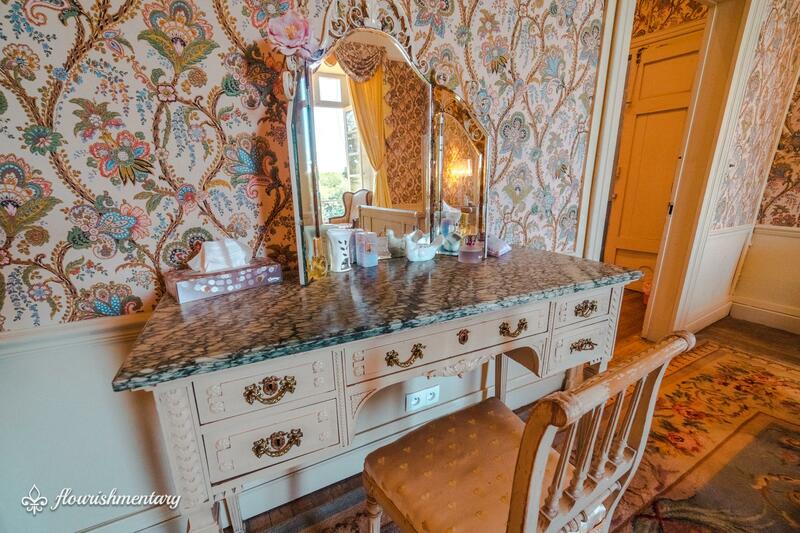 This love of hers is apparent in the stunning wallcoverings, and handmade drapes throughout the chateau. 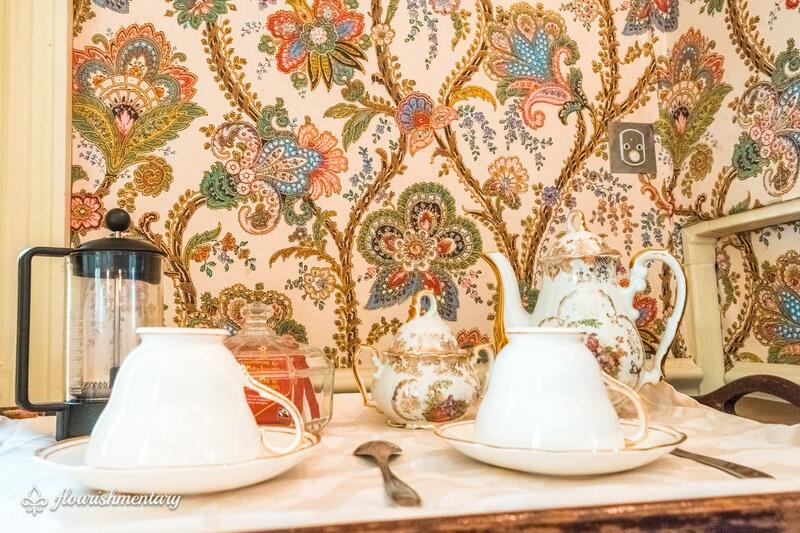 My favorite room was “Chambre Perse”, named after the exotic Persian style vintage wallpaper. The dramatic windows are clad in matching fabric, complimented by a striking yellow Sudbury silk. It’s decked out with French Belle Époque antiques, and the window seat gives guests a stunning view to enjoy with morning coffee. The Chambre Perse, featuring antique persian style wallpaper and matching drapes. Stephanie starting hosting B&B guests and workshops at the chateau a few years ago. 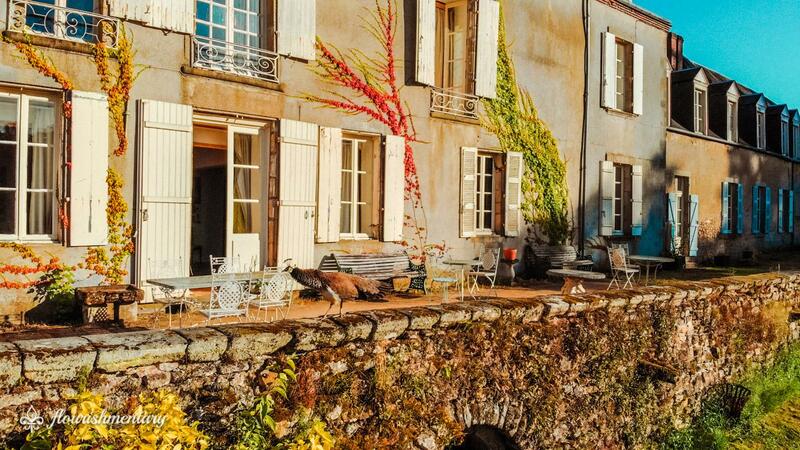 Most visitors are traveling across France, and find her home as a retreat from the hustle and bustle of major cities. Guests have also gotten to learn about her historic home on the popular British TV show: “Escape to the Chateau DIY.” The show follows Stephanie as she tackles projects around the property, along with her vivacious mother Isabelle, and soon-to-be stepfather Percy. During our visit, the Channel 4 crew came to film a special project, that’ll be revealed on the upcoming season two. 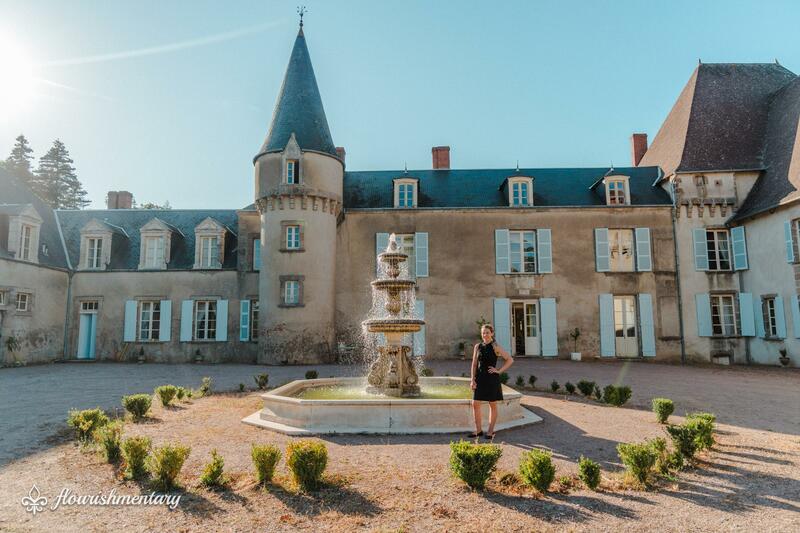 Stephanie’s been able to connect with other chateau owners who appear on the show, and bond over their shared dreams of restoring these impressive estates. Chambre de Bonne Maman features the Marquise original Belle Époque furniture. The Chambre de Roger with a lovely restored canopy bed. For now, Stephanie’s set her sights on a few other large projects. She’s in the middle of transforming the western wing of the home into private apartments, one for a friend, and one for her Mother & Percy. She hopes to turn the large open air shed into a concert hall, perfect for hosting events. She’s also excited to about completing the restoration of the chapel, perhaps one day the perfect setting for intimate weddings. While this sounds like a lot to take on, where there’s a will there’s a way, and Stephanie has already proven she has determination in spades. “That may be one of the best things about having a chateau. There’s this new dream that’s created, and it’s a communal one, and lots of people get behind it.” Becoming a Chatelaine has shown Stephanie how powerful that dream can be. Since the restoration began, she’s experienced the kindness of countless friends, family, and volunteers, who admire her ambition, and want to contribute to the success of such a remarkable place. It’s meant so much to so many for the past five hundred years, and continues to be a source of joy and inspiration for anyone who visits. And it’s easy to understand why. 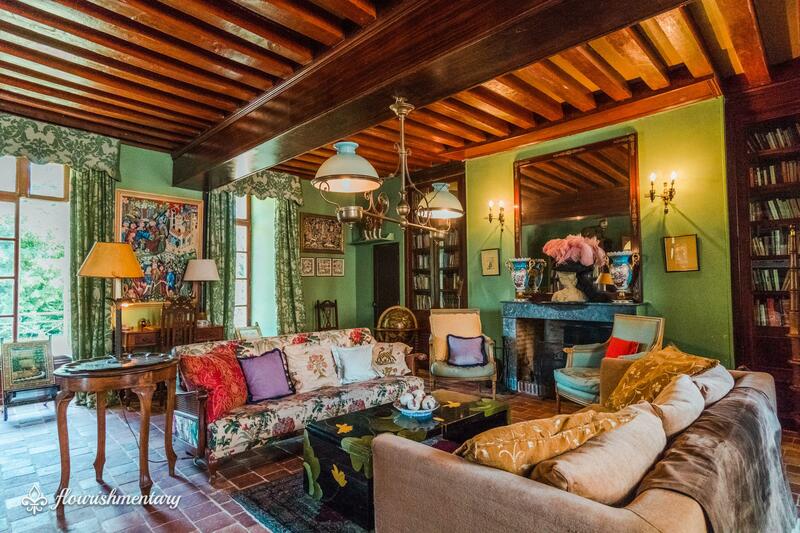 This chateau has a way of capturing your heart, and that’s just something people want to be a part of. As someone who has always dreamed of restoring a historic home someday, it was incredible to see firsthand what it really takes. Before and after shots in glossy magazines are so satisfying, but they tend to leave something important out. Taking on a project like this requires a certain level of perseverance, a passion for restoration, and a fearlessness for whatever the future brings. Stephanie’s Mother Isabelle, and her Fiancé Percy. I have such enormous respect for Stephanie and her lovely family who have guided this historic home into a beautiful new era. 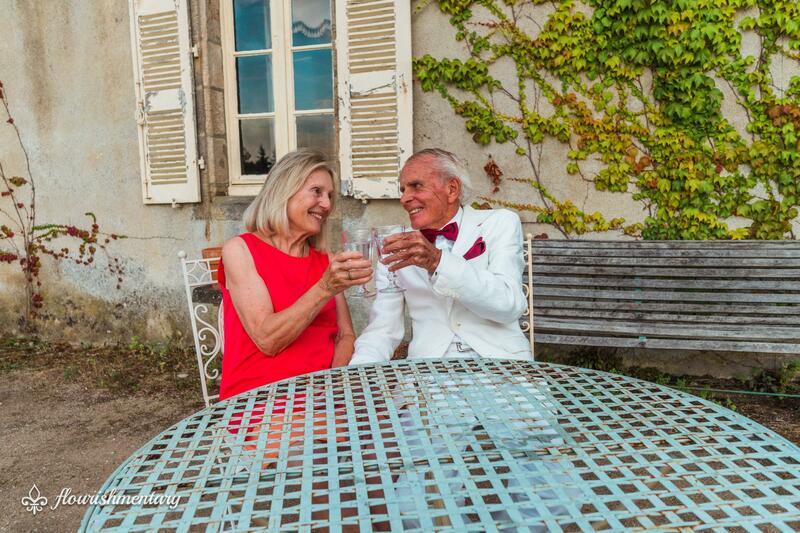 Chateau de Lalande will no doubt continue to give visitors amazing memories, just like the ones we made there. 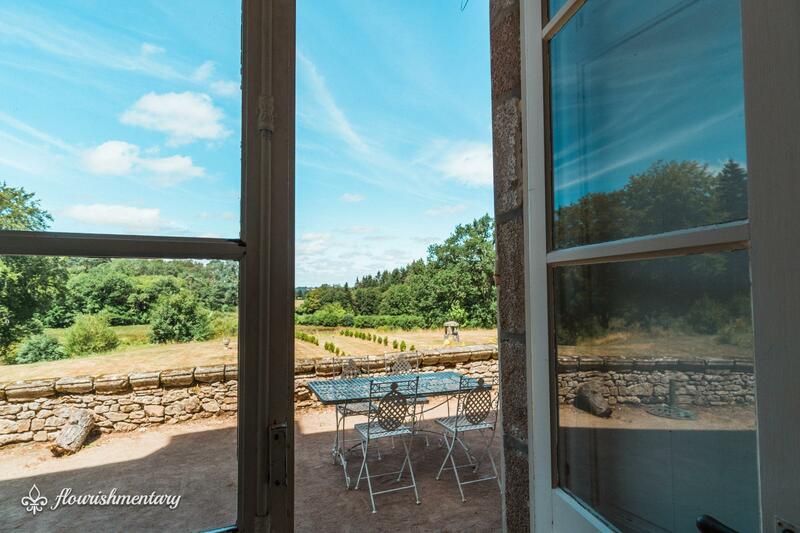 From waking up with a view of the cheery fountain, to the lovely evenings on the terrace, we loved every moment of our stay at this peaceful estate! 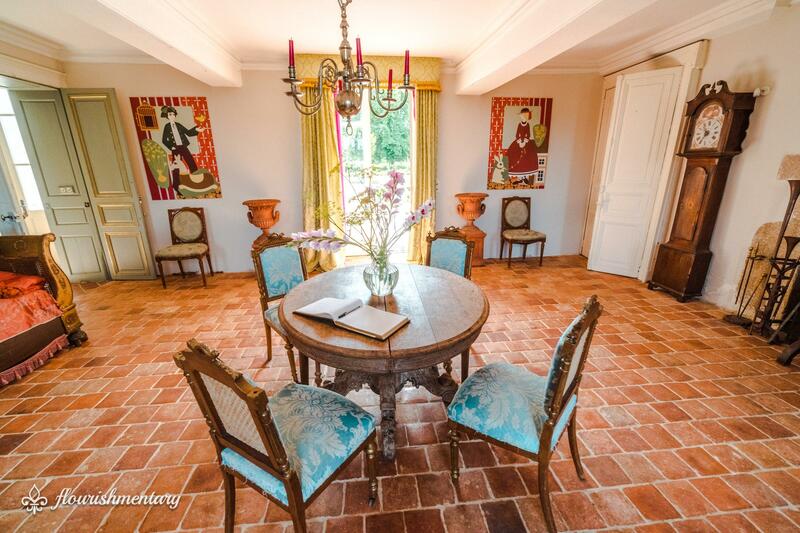 Chateau de Lalande is now hosting guests for the summer holiday season. 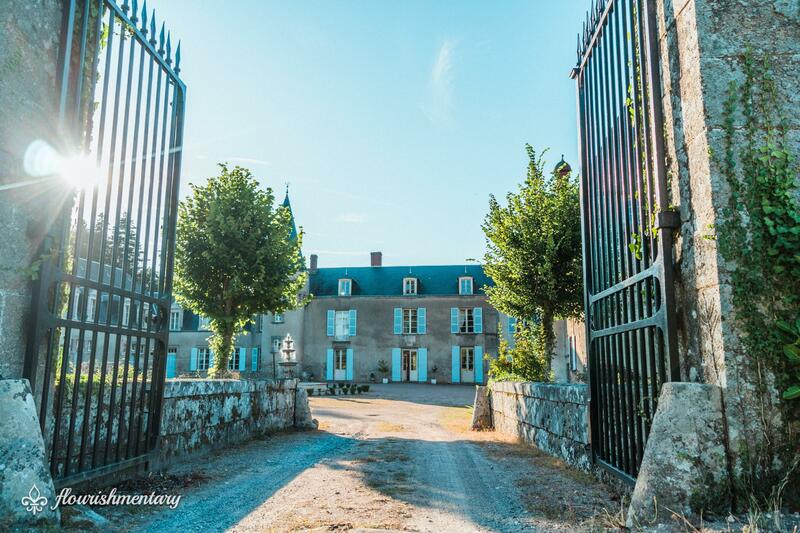 If you find yourself in France, I highly recommend staying at this charming castle. 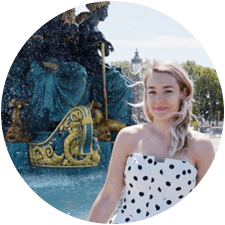 You can also catch Stephanie and her chateau tales on seasons one and two of Escape to the Chateau DIY, and keep up with the latest happenings on the chateau’s instagram page. 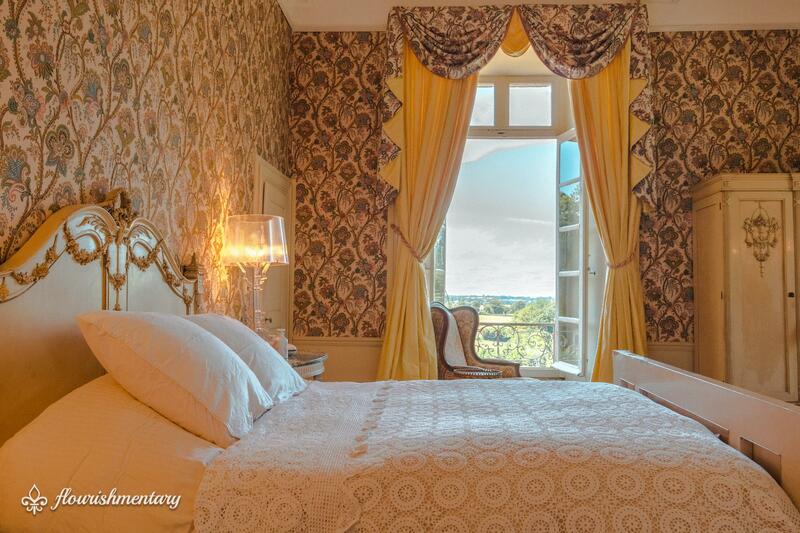 For more information, or to book a stay, please visit chateaudelalande.com. A big thank you again, to Stephanie, Isabelle and Percy, who were so lovely to give us a taste of the chateau life! Wonder what other castles you can visit? 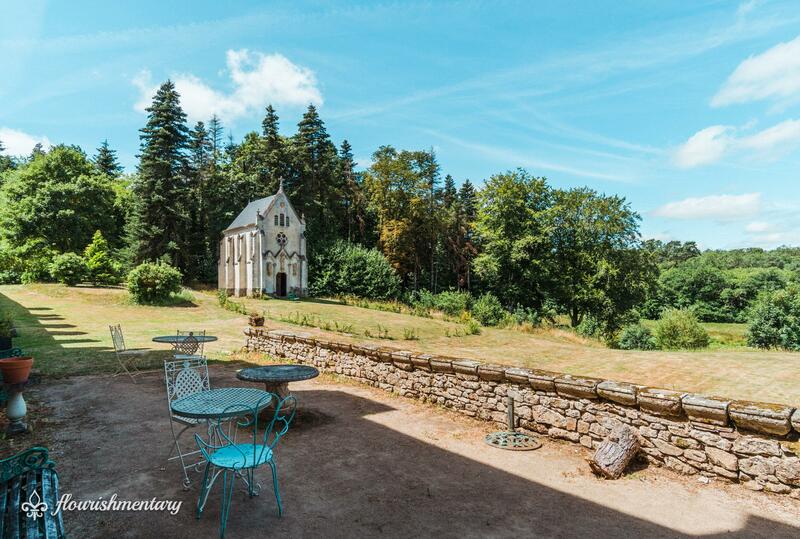 Check out this list of 15 Airbnb Castles in Europe that you can rent for your next vacation. Would you like to spend the night in a castle someday? Let me know in the comments below if a castle trip is on your list! What a great article ! Congratulations to Stephanie and to you Taylor for telling her story in such a brilliant way. The little chapel got my heart ❤ and I will definitely consider staying there in the near future. Thank you so much Flore! It’s a pretty precious little chapel, so glad you liked it! I absolutely loved reading about this restoration! Beautiful photos and an excellent write up. 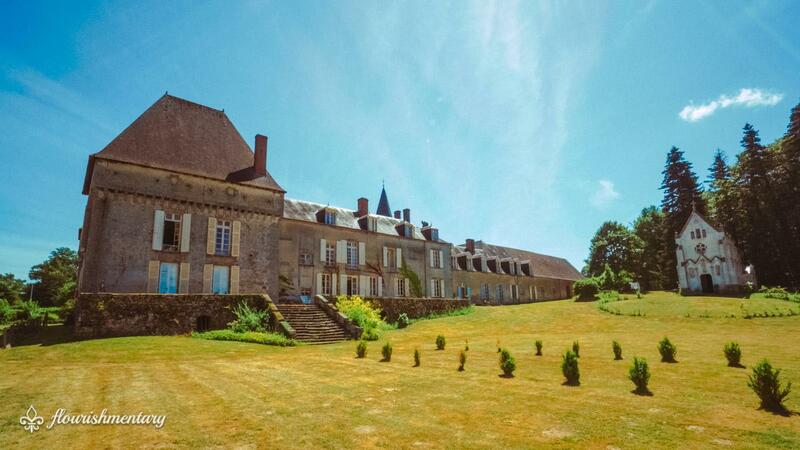 I’ll be in France this summer and I most certainly will be visiting some chateaus. Merci beaucoup! Yay! Get your chateau on! Thanks for reading! These photos are absolutely stunning! I really enjoyed reading this because I’m a fan of castles. I’ve only ever been to one in my lifetime! Wow! This castle is stunning. I never really had thought of turning a castle into a home, but definitely see the appeal now. This is absolutely gorgeous. I wish I could do this haha. 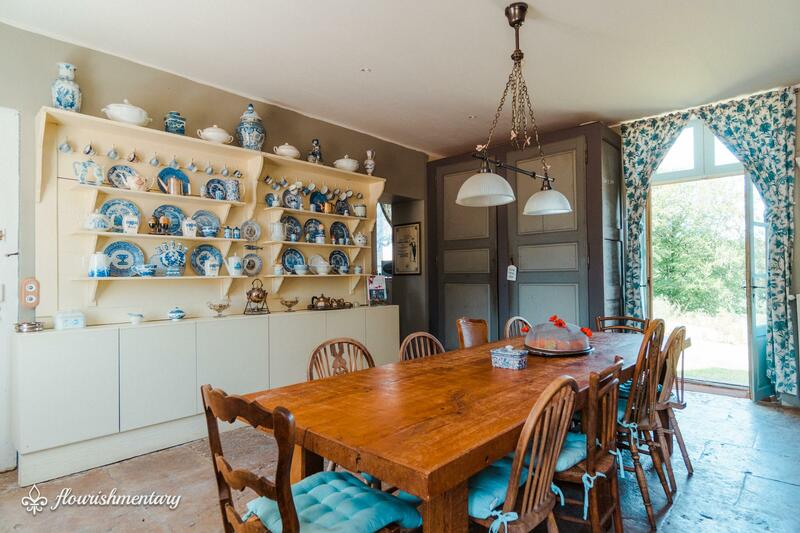 I can’t imagine how hard it was to get their hands on those vintage terracotta tiles. It really has such a sweet magic about it, and it’s amazing to see all the hard work that goes in! Thanks for reading! Wow! What else can I say? I mean the pictures alone were amazing but then you gave such great details and descriptions. I legit feel like I took a tour. Thanks for sharing! 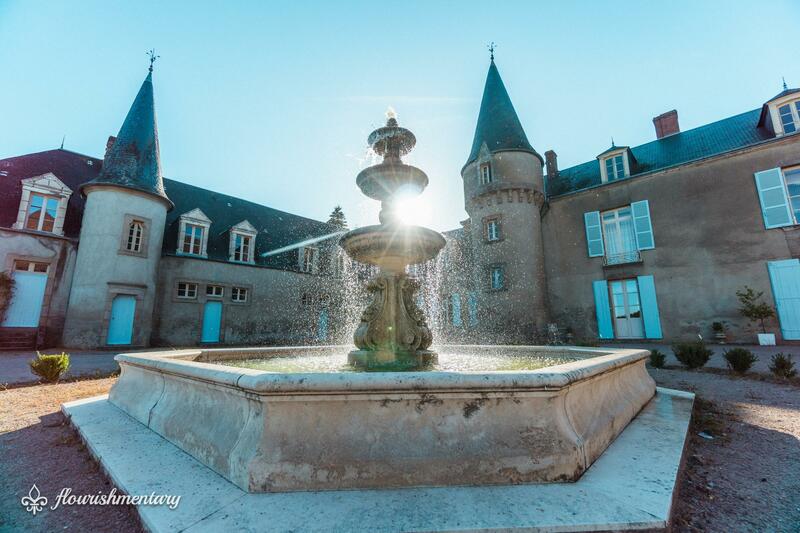 So glad you enjoyed our tour of Chateau de Lalande! Thanks for reading! It was such a neat experience! Glad you liked it, and thanks for reading! Beautiful photos of castle. Can’t imagine the hard days to stay in the same place with continuous repair work going on followed with decoration of each corner. Its like a living in a dream place. I wish some day I get to stay in castle. It is a labor of love for sure, but so worth it! Thanks for reading!